Need help with CM ToolTip glossary? Read our WordPress plugin FAQ and find information on all frequently asked questions and answers to help you with your query. Related Articles does not work, what should I do ? If for some reason, the Related articles function has stopped working on your Tooltip glossary, here is some debug info which you need to check and send to us. I am having trouble exporting to CSV file what should I do ? A simple workaround is to use Google Spreadsheet. Paste (values only if you have complex formulas) or import the sheet, and then download CSV. I’m interested in purchasing your Tooltip Glossary Pro plugin for WP, but I have a question prior to purchase. Your site says the license is for one site, and I’m wondering how my situation would apply -> I’d like to install the plugin on my test site, add contents, test it to make sure and then move it to the client’s site. Effectively, the plugin would be used on the client’s website only, after this initial phase. So my question is whether my situation would fall within you license policy? Yes, test sites are not counted in the purchased license. Can the Tooltip plugin support multiple glossaries ? After categorizing each term in the desired glossary (Terms can be stored in more than one category), a unique category shortcode can be inserted into different pages or posts on your WordPress site to display the chosen category items. The A-Z glossary index will contain all categories. Yes. You can use the Hebrew version of WordPress and install the Tooltip plugin. You can define in which pages the terms will have the tooltip and in which it will not, by going enabling or disabling the option on the “ToolTip disables” menu, which appears on the right side of your WordPress dashboard when editing a page or post. You can also use shortcodes to remove the tooltip from specific words / paragraphs. Can I remove the ‘powered by creativeminds….’ attribute from the bottom of my Glossary index? Yes. Register for the pro Edition of CM Tooltip glossary and this will be automatically removed. 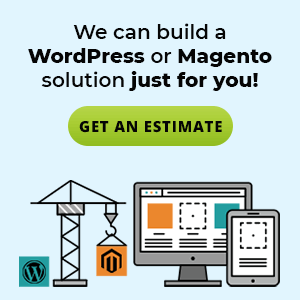 Can CM Tooltip operate with custom post types created in WordPress? The CM Tooltip Glossary plugin is designed to operate with all WordPress custom post types, as long as they are using the_content (this is a WP term related to where the content is taken from). It can also be used with specific custom fields as long as they apply the content filters. Information about CM ToolTip Shortcodes and how to use them can be found in the plugin’s settings page and differs from one edition of the plugin to another. Is cm tooltip optimized for search engine benefits? Yes. CM Tooltip glossary terms are built as WordPress Posts so they are indexed by search engines the same way that all WordPress blog posts do. 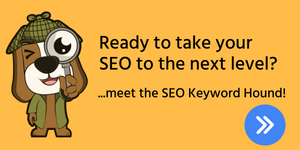 The term title is marked with an h1 tag so the search engine should look for it while indexing the term. When building the sitemap of your WordPress site, make sure to include the CM Tooltip glossary terms as part of the sitemap. When upgrading the Plugin Version, Do I just upload from the Dashboard or do I need to delete the older version? I just don’t want to loose the data I have collected. Once you’ve upgraded to a newer version of the CM Tooltip Glossary plugin, you can safely delete the old plugin version and install the new one from your WordPress dashboard. The data will not be erased. Another method is to upload using ftp but this has a disadvantage ! Since sometimes we update the database structure. So make sure you deactivate and activate the plugin after upgrading. Why is my A-Z Glossary index missing from index page? The source of JS errors can vary be from other plugins, or from your theme. You need to fix them to show the index of the terms in the tooltip Glossary plugin. Does the plugin modify the post content in the database or only on the front-end? The glossary tooltip plugin only works as a parser, which means that it doesn’t change anything in the database and only changes the post once it is displayed. Is there a way to change the glossary term’s template? Can I deactivate the Tooltip function by default on all pages/posts and to activate it only on specific pages and posts? The plugin currently suggests the opposite default method – activating the tooltip glossary on all pages and posts, and deactivating them on specific locations. Alternatively, you can completely deactivate the tooltip function on all pages and posts. You can however use a plugin which is called plugin organizer that does this action per any plugin you desire. The Tooltip Glossary since version 2.6.0 requires the mbstring PHP module to be set. This is done in order to support UTF8 in a better way than before. CM Tooltip Glossary is a powerful tool but it still has it’s requirements to work properly, which is why we’ve created a “Server Information” tab in the plugin Settings. The server information tab enables users to easily check for the most common server-related problems that could be interfering with the CM Tooltip Glossary. “Highlight terms on posts?” “Show tooltip when the user hovers over the term?” should both be checked. The typos are sometimes very hard to catch on a first glance, CM Tooltip Glossary can cope with case-insensitive words, but unfortunately isn’t able to find those too. This is a problem on the pages heavily loaded with plugins, especially the older ones which depend on old versions of JS libraries (e.g. jQuery). Also sometimes ad-blocking browser plugins cause JS errors so it’s good to disable them on tested sites. If all of above fails, that may mean your theme is not outputting your post content with the “main” WP query, so as a last resort you may want to try unchecking this. If you’ve tried out everything from the list above and still the terms are not highlightened on the posts of your page, then there’s probably a conflict between our plugin and one of the other plugins activated on your site. In that case please contact our support (please be sure to provide the admin access to your site) and we’ll try to help. 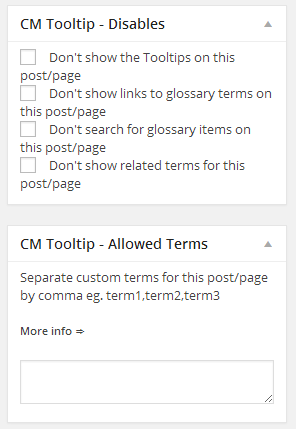 How to display CM Tooltip Glossary metaboxes on custom post type? The PRO editions of the CM Glossary Tooltip provide the metaboxes giving the options to override the general plugin options on given post/page. Those metaboxes are by default only displayed for Glossary terms and built in Posts and Pages. To display the CM Tooltip Glossary metaboxes in all post types without writing any code – go to Settings -> General Settings and find the section called Metaboxes. If there’s no Metaboxes section it means you need to update your plugin. This way is more complicated as it requires some code manipulations. The code snippet below should usually be placed in the functions.php file of your active theme. It adds a function which adds two new Custom Post Types (‘your-custom-post-type’ and ‘another-custom-post-type’) to the list of post types displaying the metaboxes. To use it, find the ‘your-custom-post-type’ and exchange it with the Custom Post Type you want. Are community terms added automatically? That largely depends on your choice. In the plugin settings, you can either choose to auto-approve new term suggestions, or have them pending an administrator approval. If you choose the later, the plugin system will let you moderate visitor term suggestions before they get published and added to your website’s vocabulary.